The road still continues along the side of the river, and in a few minutes we come upon the highway at Matlock Bridge, a fine structure of four arches spanning the Derwent. Here the scenery becomes more varied and interesting, and the beauties of Matlock Dale first begin to unfold themselves. In front is seen Matlock, or Matlock Town, as the people call it, to distinguish it from Matlock Bath, pleasantly situated on the lower slope of a hill, the foot of which is washed by the river. Like most towns in Derbyshire, the houses are built of stone, and present a cleanly and well-to-do appearance. They are surrounded by hills, except towards the north, whence a beautiful view opens along a wide and highly cultivated valley that extends to Darley Dale and Rowsley. The church, an ancient structure, erected at different periods, has a fine effect from the charming situation it occupies on the edge of a bold precipitous rock. The singular appearance of this rock cannot fail to arrest the attention of the tourist, from the peculiar dip or inclination of the strata which it exhibits ; the crest is covered with trees and brushwood, but the lower face is bare, and the several strata of which it is composed can be distinctly traced, presenting the appearance of a number of lines extending in a regular undulating or waved curvature for a distance of a couple of hundred yards, when they become lost by dipping under the shale near the town. The singular effect has been produced by one of those occurrences which geologists term "faults," and which are owing to the upheaving of the strata by volcanic force. To the left of the spectator, and within a short distance of Matlock, is Matlock Bank, a little hamlet consisting of a few cottages scattered irregularly over the hill side, prominent in the midst of which is the Hydropathic establishment of Mr. Smedley. Matlock Bridge is rapidly rising into eminence, and promises soon to become a dangerous rival to Matlock Bath. Recently a company has been formed for the erection of a market hall and hotel - the former, a neat structure in the pointed Gothic style, has been built, and the latter is now in course of erection, and when completed will be one of the handsomest buildings in the neighbourhood. Leaving Matlock Bridge we proceed along the road, the scenery at every step increasing in beauty and assuming a more bold and striking character. As we advance the dale becomes more contracted, and near the Boat-house public-house on the roadside, we obtain the first view of Masson and the Heights of Abraham, a part of the great chain of hills that forms the eastern boundary of the Derwent. Approaching the toll-bar, the road, following the course of the river, makes a sudden curve towards the left, after passing which, Matlock Dale, with the stupendous High Tor and the long line of lofty wooded rocks bordering the river, bursts upon the astonished beholder in all their glory and magnificence. No pencil can portray or pen describe the glorious scene, and language is impotent to convey an idea of the beauty of it ; there are, indeed, few spots in England or elsewhere more romantically grand, or where such a varied and striking assemblage of rock and river scenery can be met with as is here presented to the view. Matlock Dale is a deep and winding valley that extends from Matlock Town to Cromford, a distance of nearly three miles, everywhere wildly romantic and rich in picturesque combinations. It is bounded on one side by lofty hills, finely wooded and dotted over with pretty Swiss-like cottages and villas of every variety and form embosomed in trees of richest foliage; some picturesquely built on the verge of craggy precipices and in out-of-the-way places that would seem to preclude the possibility of approach, whilst others are hidden from view by the thick umbrage, their presence being only indicated by the thon line of blue smoke that ascends and hangs in hazy wreaths about the tops of the uppermost trees. At the bottom of the valley the majestic Derwent sweeps majestically along, its placid surface rich with the reflected hues of the varied foliage that overhangs its devious course. 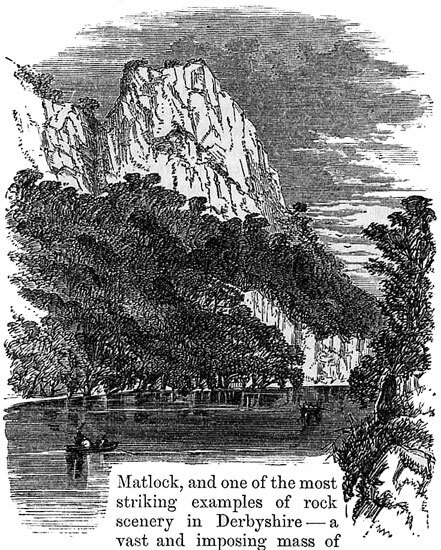 On the opposite side of the river is seen a long range of limestone precipices, curiously stratified, that rise abruptly from its banks and tower aloft to a prodigious height, finely diversified by a regular alternation of rock and wood, here mantled with light and elegant foliage, and there displaying broad masses of whitened surface, relieved by creeping lichens and variegated by the different colouring of the ferns and mosses that adorn their channelled fronts. Matlock, and one of the most striking examples of rock scenery in Derbyshire - a vast and imposing mass of limestone, with a bold convex front that lifts its precipitous form to a height of upwards of 350 feet, casting a perpetual gloom upon the vale below, and producing in the mind of the spectator feelings of mingled awe and admiration. The sloping base is covered for a considerable way upwards with a dense tangle of underwood - hazles, honeysuckles, wild roses, and brambles - from the midst of which rises profusion of trees of different kinds, the elegant mountain ash, the pale drooping willow, the gnarled and knotted oak, and the delicate pensile birch, mingling their leafy branches in a density of luxurious verdance, beneath which the graceful Derwent glides along, frequently hidden by the overhanging trees that fling their broad leafy boles over its glittering waters, subduing the dazzling brilliance with their sombre shade ; at times it becomes impetuous and even turbulent, as, wasting its strength in whitened foam, it dashes over the rocky fragments that impede its course, then again it subsides into a rippling current, and carols merrily, like a talkative companion by the side of the wayfarer. The upper portion of the Tor for more than 150 feet presents one vast mass of naked perpendicular rock indented with rents and fissures, from the crevices behind which peep out tufts of grass and shrubs and flowers, with here and there a few stunted trees that seem to have sprung spontaneously from the openings, and which afford an inaccessible retreat to hundreds of noisy rooks and daws. Within the last few years the grounds on the High Tor have been enclosed and laid out in ornamental walks that wind in and out among the shrubs and trees with which the whole hill-side is covered, every turning bringing fresh beauties before the eye. Near the summit the walk has been continued over a narrow ledge of rock that extends round the very verge of the Tor, and from this giddy height an uninterrupted view is obtained of Matlock Bath with its villas, its shops and cottages, the beauteous Derwent and the charming country surrounding it. A pathway has also been formed along the bottom of a deep perpendicular gorge or fissure caused by the shrinkage of the limestone, to which the name of the Fern Cave has been given from the profusion of these and other wild plants and flowers that grow out from the interstices and peep from every rent and crevice of the rock. We lingered sometime in the contemplation of this impressive scene ; evening was creeping on, and a calmer light spread around ; one side of the vale was enveloped in shadow, on the other the declining orb threw the rich radiance his farewell beams, gilding with brilliant touches of light the highest peaks of the majestic Tor, and sparkling through the fringe of foliage that crests its lofty summit. The thrush, the goldfinch, and the yellow hammer were sporting merrily about, and through the umbrageous trees we could discern the gaily plumaged king-fisher flitting beneath the pendant branches, and the swallows chasing the flies as they skimmed the surface of the stream ; and the ear listened the while with delight to the gentle harmony of the dancing leaves, the busy hum of insects, and the song of birds, mingled with the echoes of the brawling and angry current that foamed and eddied along its rocky channel. To the geologist the High Tor is especially interesting, from the fine section of the strata which it exhibits ; near the base a stratum of toadstone intervenes, separating the first and second limestones, and on the opposite side of the dale these different strata are answerable to each other, affording strong presumptive evidence that the two sides were formerly united in one solid mass, which has been rent asunder by volcanic force at some remote period of the world's history. Farey, in his "Agricultural Survey of Derbyshire," has included the High Tor in his section of the three lowest assemblages of strata known in Derbyshire, commencing at Riber top, and extending to the highest point of Masson. Opposite the High Tor the river is spanned by a little wooden bridge that leads to the Crystallized Cavern, close to which is mill for grinding barytes. This mineral, provincially termed "cawke," is found in considerable quantities in the limestone districts of the Peak, it is generally associated with calcareous spar, and frequently forms the matrix of the richest lead veins ; it is of a dingy white or dull yellow tint, and after being washed and ground, is manufactured into a pigment of a fine white colour, known among painters as Dutch lead. Leaving the barytes mill we crossed a narrow channel that has been cut from the weir to a lead mine close by, and on the opposite side of which, at the foot of the rock is the High Tor Grotto, or Crystallized Cavern. This, though less extensive than the other caverns at Matlock will, from the splendour of its mineral decorations, and the beauty and perfection of its crystallizations, be inspected by the mineralogist with great interest and satisfaction. The guide to the grotto is a most loquacious individual, but withal a painstaking, civil, and well informed man ; and notwithstanding the peculiarities of his descriptions, and his boasted knowledge of geology, you have the satisfaction of knowing that his information is of a genuine character, acquired by practical acquaintance with the subject, he having in early life followed the occupation of a miner. The High Tor grotto is very easy of access, and may be explored without difficulty. Passing through the little stone shealing erected at the entrance, and taking each a lighted candle, we followed the guide along a level path that penetrates into the heart of the Tor. The roof and sides of this natural excavation are everywhere encrusted with a profusion of crystallizations of calcareous spar, chiefly of the scalon-dodecahedron and double-pyramid or dog-tooth shape ; many of the crystals are of the most perfect form, and some are of very large size, measuring ten or twelve inches in length. On entering the cavern the attention is arrested by an immense layer of spar, presenting a vast aggregation of dog-tooth crystals, intermingled with fluor spar and lead ore, and here and there exhibiting traces of carbonate of copper, iron pyrites, and other mineral substances. Further on, on the left, is a thin stratum of clay separating the trap or toad-stone, from the upper limestone measures; about midway a rude kind of chandelier, garnished with candles, is suspended from the roof, and when this is lighted the effect is brilliant in the extreme, the myriads of crystals, here congregated together, glow with the reflected light, glitter and sparkle with a gem-like lustre. Near the further extremity the path gently descends, the roof becomes lower, and presently a lake of clear water is reached, some sixty feet across, beyond which the rocks close in, when all further progress is precluded. Whilst exploring the cavern, we were startled by a loud reverberation resembling the rumbling of distant thunder, caused, as the guide informed us, by the passage of a train through the tunnel over our heads. On regaining the entrance, we found exposed for sale a good collection of crystallizations, fluor spars, fossils, and other, natural productions of the neighbourhood, including some fine specimens of dog-tooth spar, the crystals being nearly a foot in length, and of a pale green colour. In the collection we noticed a curious example of the barytes family, found in the dunstone, near Middleton, by Youlgreave ; the transverse section of this substance, when, polished, is of a rich vandyke or reddish brown colour, and its configurations bear some resemblance to the variegated tortoiseshell without the transparency, being curiously radiated in a series of concentric circles, that have evidently been formed by successive depositions. Continuing our walk towards Matlock Bath, the buildings become more numerous, cottages and lodging-houses line the western side of the road, and rise in tiers along the slope of Masson ; some are castellated, and others exhibit a blending of the Gothic and Italian features ; many have little plots of garden in front, and their appearance is improved by the clustering ivy, and the gorgeous blossoms of the golden laburnum with which their walls are bedecked. Near the Parsonage is an extensive quarry, from which the limestone is obtained, and as we passed by the men were busy at work upon the large blocks that had been brought down by a recent "blast", breaking them into smaller pieces preparatory to their removal to the furnace. The side of the quarry where the rock is exposed has a very singular appearance, the strata dips at an angle of about 45Â°, and every layer may be distinctly traced, seeming to the eye as though at the formation of the earth the y had been carefully laid on in successive courses. Beyond this quarry the scenery loses somewhat of its wild and rocky character, and assumes a more sylvan appearance. Presently we come to a place where a road branches off on the left, and crossing the river, leads up to the railway station - a neat Swiss structure - whence it is continued through the little hamlet of Starkholmes, and on to Matlock town, where it again joins the main road at a point near Matlock Bridge. Nearly opposite the railway station the river sweeps towards the right, and following the curve, we enter the thriving town of Matlock Bath.